There is always a good feeling about shooting over new ground. Anticipation is high and the excitement increases with the onset of dawn or dusk. Here’s some comments from wildfowlers around the country. This is one of the most famous spots on the west coast. 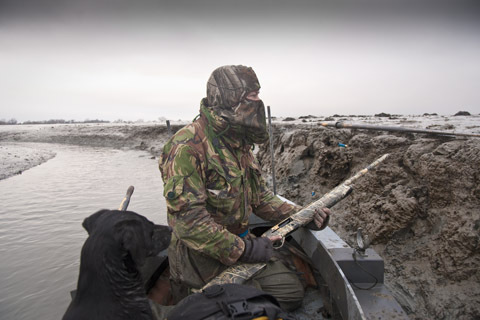 Wildfowling has been practiced there for over a couple of centuries. After the Second World War, the saltings built up substantially, as did the number of shoulder gunners keen to try their hand at the sport. A combination of the two severely restricted the activities of the big gunners. Whether it was a result of ex-servicemen finding themselves with a little more disposable income, or to supplement the meagre family meat ration, there was a definite nationwide upsurge in the free shooting available on the foreshore. Many wildfowling clubs here are now celebrating their 50th or 60th anniversaries. The Dee Wildfowlers’ Association was founded in 1952 and by the end of that decade had over 1,000 members! With Welsh and English shores, those members were mainly natives of Flintshire, Cheshire and Merseyside. Nowadays the club limits its intake to 120, but can still be rated as a leading quarter for the sport. There are many fine spots north of the border with well-known estuaries and firths such as Cromarty, where zostera grass still survives, enticing strings of wigeon to fly close along the shore. But they aren’t easy to shoot – it’s said that you are more likely to shoot a goose than make a bag of wigeon. The John Muir Country Park in East Lothian is run by the local authority and comes highly recommended by a very experienced Scottish wildfowler. It is particularly good for visiting gunners, as access to the foreshore is easy and safe. No shooting is allowed after 10am or before 3pm, but the system appears to work well. Wildfowling permits can be obtained from East Lothian Council (free of charge) and include good maps. The estuary is very scenic and used by a good variety of duck, mainly wigeon, but most of the surface feeders put in an appearance. 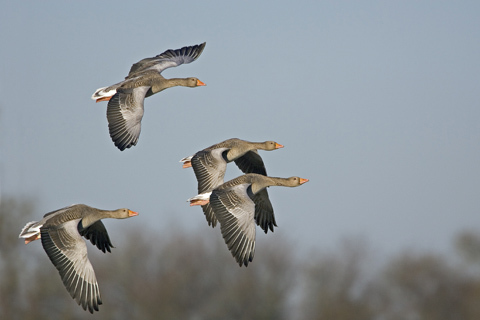 Early season geese are greylag and Canada, with pinkfeet turning up later on. 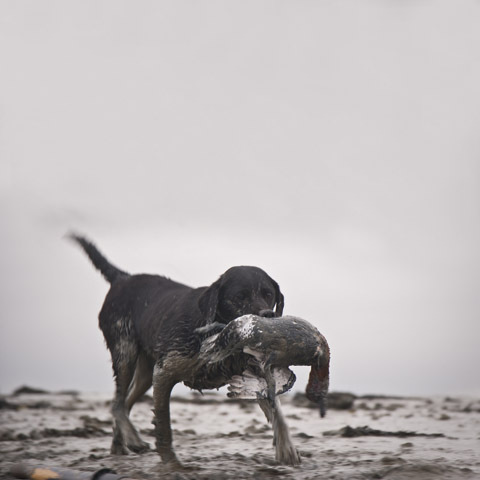 With 500 members and substantial land ownership, Kent Wildfowlers is probably the largest club of its kind in the UK. On the south shore of the Thames they have extensive shooting rights through the Medway Estuary and up the valley west of Rochester. There are many miles of seawall, mudflats and salt marshes, as well as islands. Land ownership extends beyond the county boundary onto the Essex marshes and as far away as north Norfolk. Owning our own marshes is the best any of us can do to ensure our sport is as secure as possible and the Kentish wildfowlers have taken this to heart. 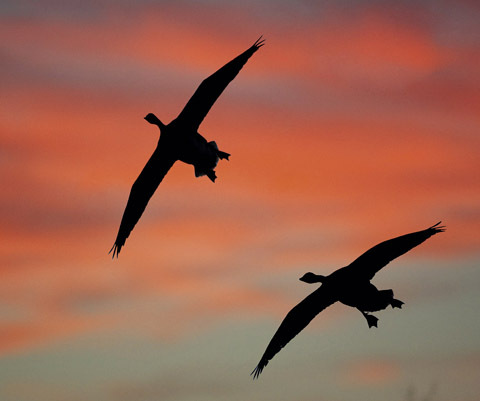 Greylag geese at sunset – a majestic scene and an exciting sporting chance. The Medway is famous as an estuary where the shooting of duck over decoys is an option. Permits to shoot are quite expensive and limited. Members can take a guest, however. Fancy shooting from a boat? Then apply for a flight with the Dorset Wildfowlers who shoot the crown foreshore at Poole Harbour. Access is only possible by boat and visiting guns must be accompanied by a guide. This is a sensible rule in any location where one is a stranger. The Hull and East Riding WA issue permits for the season in this district. Further upriver, day tickets to shoot at Winteringham, near Read’s Island, can be obtained from the South Humber Joint Council. What about the Cambridgeshire Washlands, Halvergate and Acle? I can hear the protests now. How could you leave out the Wash, or north Norfolk? What about the fresh marshes, like the Cambridgeshire Washlands or Halvergate and Acle? Purists might decry anything other than the coast, but the same skills and fieldcraft have to be engaged if a bag is to be made on these inland haunts. As the experienced man will know, wherever you go in search of wild duck or geese, everything depends on the conditions on the day. Good luck!